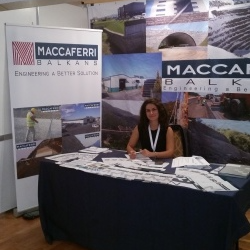 Maccaferri Hellas has participated in the 2nd International Congress of Roads which was held in Tirana, Albania. materials used in road works and solutions to problems of transportation infrastructure which occur during the design and the construction phase. Our technical specialist Mr. Alberto Grimod’s presentation referred to secured drapery systems for superficial instability of rock slopes, while our colleague Mr Taulant Alilanj presented innovative combined solutions by applying geotechnical materials to road construction. Maccaferri Balkans sponsored this great event and our stand was full of visitors interested in our solutions and our “know how”. Contact us here to discover more.